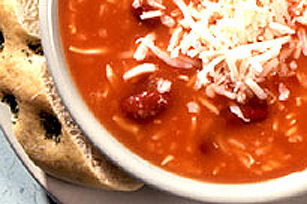 Make some homemade minestrone in minutes with our Cheese Italiano Minestrone Soup recipe. Warm up on a chilly day with a hearty bowl of soup that's chock full of Italian flavour. PREPARE soup with water according to label directions. ADD rice and bring to a boil; let stand 5 minutes. Add beans and seasoning. STIR in cheese. Serve with garlic bread.